In 1995, my friend Patrice Young (Small Meadows) and I joined JSBA. And we got the sale catalog from Craft’s at Blufton. 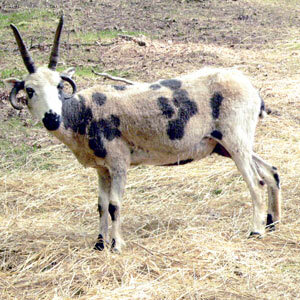 Tucked away in north Georgia, with its slim population (at that time – many changes since then) of registered – or even with known pedigrees – Jacob Sheep, the Craft’s catalog was a shepherd’s wishbook. Unable to splurge that year on more sheep, I was able to share the excitement with Patrice of choosing 4 ewes to make the trip from Iowa to Georgia. Patrice chose Craft’s Praline, Craft’s Salvia, Craft’s Alice, and Craft’s Lorelei. 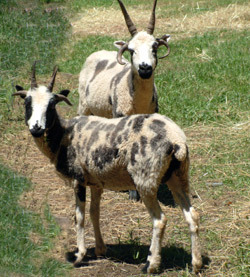 When Bob Norton brought the sheep to Georgia, he included an extra 3 ewes, Craft’s Jana, Craft’s Molly, and Craft’s Ruby’s Belle, in case Patrice wanted to switch. Patrice, never one for restraint (love you, girl! ), took all seven. When I made the trip to see the new sheep, I was immediately drawn to one ewe – smitten, in love, and just amazed at such a lovely animal. Craft’s Ruby’s Belle captured my heart in an instant. She had been advertised in the Craft’s catalog as the “Belle of the barn yard”. Patrice was kind enough to offer her to me. At the time, I was awaiting some medical test results, but I told myself if the tests came back negative, I was going to buy RubyBelle as a celebratory gift for myself. The tests came back negative and I bought RubyBelle. RubyBelle came to Patchwork in 1996 as a yearling. She was the “belle of the backyard” on the small acreage we had then. She will always be my ideal Jacob. She had a lovely, long, lightly crimped fleece with a demi-luster that made her fleece just perfect for blending with silk. She had long legs – being taller, but lighter, than many of my other ewes. She “tracked” when she walked as do so many of the old primitive Jacobs. She made me think of a runway model when she walked. She lambed easily and raised her lambs with no assistance. But, she was not a doting mother. She called and she expected the lambs to come and nurse – on her schedule. I don’t know how she would have been with a weak lamb since she didn’t have any, but I think she might have just spent her time on the healthy twin. She had primitive instincts to go along with her primitive look. She was independent and aloof. She was gentle and never fought to be the boss ewe, but somehow she was. I could always tell when she was pregnant because she would decide to accept treats from my hand – no other time. She was not flighty, but was not a sheep that cared to be petted or cuddled. She had a special spot under a tree where she preferred to lamb. 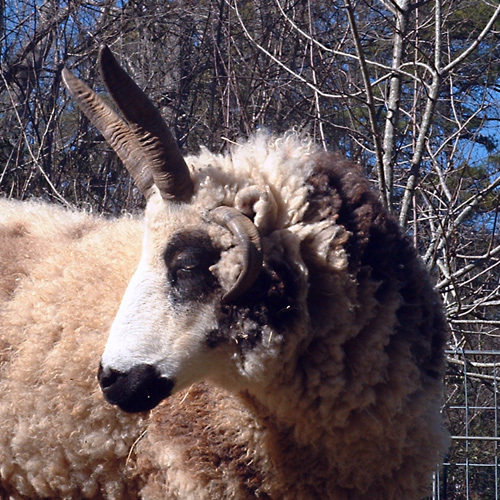 She once refused to breed to the ram of my choice and spent her estrus backed up to a wall in the barn to thwart the unwanted ram. She was a daughter of Hardy Hill Leo and Puddleduck Ruby. 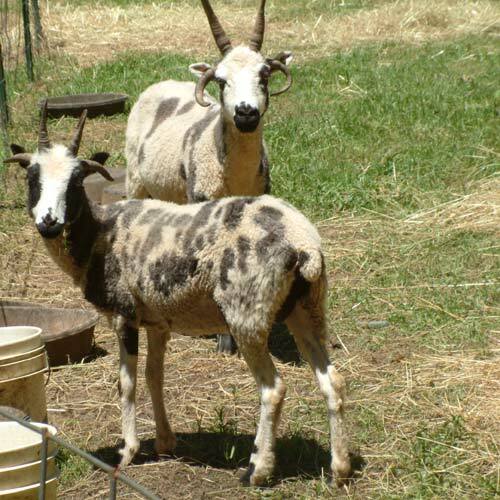 Granddaughter of two Sheepside, PMA Clinton and Puddleduck Amber – the ewe that earned a dedication from Ingrid Painter in the book, Jacob Sheep in America. RubyBelle leaves her presence behind in her offspring and in my heart. Good bye my belle. Always in my heart. It is always so sad to see them go; but especially so after so many years of serving you well and being a good mom. Rest in peace, Belle of the Backyard. Enjoyed reading about Miss Belle. It’s easy to see how happy and loved she was! So sorry for your loss. What a wonderful tribute to Ruby’s Belle. I enjoyed hearing more on her background and how she came to you. She lived her whole life with you and that’s something that rarely happens nowdays. 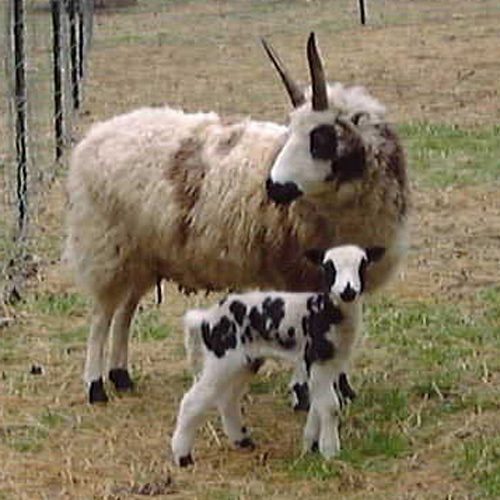 She was a lovely ewe and I know you miss her dearly.